Purl Stitch. Two Methods of Purling. The Purl Stitch. Two ways of purling it. Variant #1. Should be used for the knit stitch knitted through the front loop This combination of the purl and knit stitch is a classical and the most often used way of knitting. Variant #2 (or Granny"s PURL STITCH) should be combined with a knit stitch knitted through the back loop . This variant is recommended for knitting of the stockinette fabric since it comes out more dense and better quality to compare to Variant # 1. Not recommended for the lacy patterns. What will happen if you blend the methods you knit and purl not the way recommended above? Nothing terrible actually. It will still be knitting/purling, but the quality of the knitted fabric will be slightly different. It is still not a bad idea to follow recommendations given above, if you really care about good quality of fabric for your project. Let's compare these two pictures below, to understand difference between them. 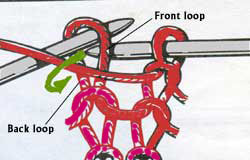 Position of the loops on the left needles for both Variants is the same: Front loop is ON THE TOP of needle while back loop is BEHIND the needle. Completely different picture is on the right needles. Variant # 1. Front loop is ON THE TOP of the needle while back loop is BEHIND the needle. Nothing has being changed when we moved stitches from the left needle to the right one. Variant # 2. Front loop is BEHIND the needle while back loop is ON THE TOP the needle. The way we knitted stitches in this case change position of the loops to opposite. Knit stitch through the front loop + Variant #1 for purling OR Knit stitch through the back loop + Variant # 2 for purling. As a rule, Variant #2 purl and knit stitches produce a better quality stockinette fabric. 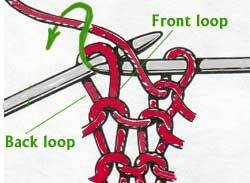 Methods to knit purl stitch. 1. Yarn is on the front side of the left needle. 2. Insert the right needle from right to left in the first loop on the left needle behind the working yarn. 3. Wrap the yarn counterclockwise, and draw the new loop in through to the back. 4. Drop off the old loop. 2. Insert the right needle from right to left in the first loop on the left needle on the working yarn. 3. By the end of the right needle pool the working yarn through the loop. Here is a video which demonstrates Variant #1 of purling a stitch. In this case a knit stitch is knitted through the front loop. A knitter uses continental style of knitting. For the American / English style of knitting everything will EXACTLY be the same, but a working yarn has to be supplied by the right hand. As usually, the very same result can be achieved in a few different ways. Here is another video (not the greatest quality unfortunately) which also demonstrates Continental knitting with knit stitch worked through the front loop and for Variant # 1 purling. I prefer this method since it is much more ergonomic to compare to the previous video. Besides that it is much faster because you are making fewer movements per each stitch. The more knitting experience you gain, the more methods of making a purl and a knit stitch you will learn. But two Variants described here is a good start. Sometimes blending both these variants creates very interesting decorative effects. For example, a twisted stitch produced by blending these two Variants is a way to avoid the holes along the raglan lines while knitting a top-down seamless sweater.